§ 300-27 Uses specifically prohibited in all districts. § 300-28 Supplementary yard requirements. § 300-29 Supplementary requirements for buildings and structures. § 300-30 Supplementary requirements for signs. § 300-31 Supplementary environmental requirements. § 300-32 Average density (cluster development). Shooting galleries, amusement arcades and other uses of a similar nature are prohibited. Roadside stands or any retail business conducted from temporary or nonpermanent structures or outdoors on lawns, sidewalks, driveways or patios is prohibited, except as allowed under Chapter 277, Vending, Peddling and Soliciting, of the Code of the Village of Cooperstown. Any use of land, building and structures or any industrial process that may be offensive, noxious or injurious by reason of the production or emission of dust, smoke, heat, glare, refuse matter, odor, gas, fumes, noise, vibration or similar substances or conditions is prohibited. Emission of smoke, as measured at the point of emission, which is darker or more opaque than Number 1 on the Ringelmann Smoke Chart published by the United States Bureau of Mines, is prohibited, except that smoke not darker or more opaque than Number 2 on said chart may be emitted for periods not longer than four minutes in any 30 minutes. High-pressure boilers, equipped to operate regularly over 15 pounds per square inch, are prohibited except in the Commercial District. Establishments offering adult entertainment in any residential district are strictly prohibited. Establishments offering adult entertainment within 500 feet of any residential district or within 800 feet from a school, house of worship or day-care center are also strictly prohibited. Portable storage containers that do not comply with Subsection F(2) of this section are prohibited in the Village of Cooperstown. Only one portable storage container may be placed on a lot. A portable storage container may not exceed the dimensions of 16 feet in length, eight feet in width, or eight feet in height. The portable storage container may not be located within the front yard setback and may not violate the minimum yard dimensions for the district in which the lot is located. However, the portable storage container may be located on an existing residential driveway within the front yard setback, provided it does not obstruct the sidewalk or a shared driveway, and the driveway is not within the side yard setback. No hazardous material may be stored in a portable storage container. A portable storage container may not remain on the lot for longer than a total of 93 days in any consecutive three-hundred-sixty-five-day period. At least three business days before a portable storage container is placed on a lot, a lot's owner shall apply to the Zoning Enforcement Officer for a portable storage container permit. The permit application shall include the owner's name, residence address and telephone number, the lot's street address, and the date on which the portable storage container will be placed on the lot. If the Zoning Enforcement Officer determines that the application is complete, he or she shall grant a portable storage container permit for a thirty-one-consecutive-day period. If a lot owner, in a written request, demonstrates a bona fide reason for an extension, the Zoning Enforcement Officer may grant two extensions of the portable storage container permit for a period that does not exceed 31 consecutive days, and that does not exceed the limit set forth in Subsection F(2)(e) of this section. This subsection does not apply to a construction trailer used at a construction site where permitted residential or commercial construction is being undertaken and where the trailer is utilized for construction storage and/or temporary office purposes. The Board of Appeals may permit a garage accessory to a residence to be located within the front yard where, due to topographic conditions, there would be practical difficulties in constructing a safe and convenient drive from the street; provided, however, that such garage shall not adversely affect the future use and development of adjacent properties. No shrubbery, hedge or other natural growth, fence or wall over three feet higher than the apex at the center line of the street shall be located within the triangular area shown shaded in Sketch A below at the intersection of two streets, nor shall the limbs or foliage on any tree obstruct vision or be permitted to grow nearer to the ground than eight feet where such limbs or foliage overhang or are over land within the triangular area as shown in Sketch A. An unroofed terrace or patio which is not more than one foot above ground level, or an arbor, open trellis or flagpole, is permitted in a required yard. An open fire escape, deck or unroofed porch, or terrace which is more than one foot above ground level may project not more than six feet into a required rear yard. An awning or movable canopy may project not more than 1/2 of the distance into a required yard; cornices or eaves may project not more than 24 inches into a required yard. A fence or wall is permitted, as defined under "fence" and "yard" in Article XVI. A fence which is installed along a lot line or within any yard shall have a comparable quality and appearance on both sides. 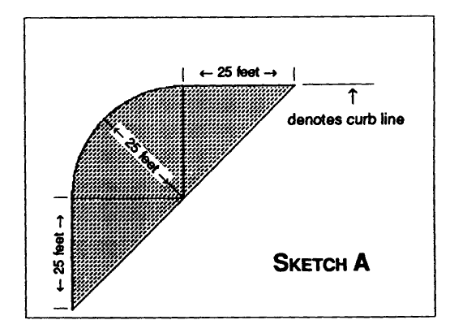 All required front yard depths shall be measured from the designated street line, front lot line or existing street line, whichever is a greater distance from the center line of the public street abutting the lot in question. 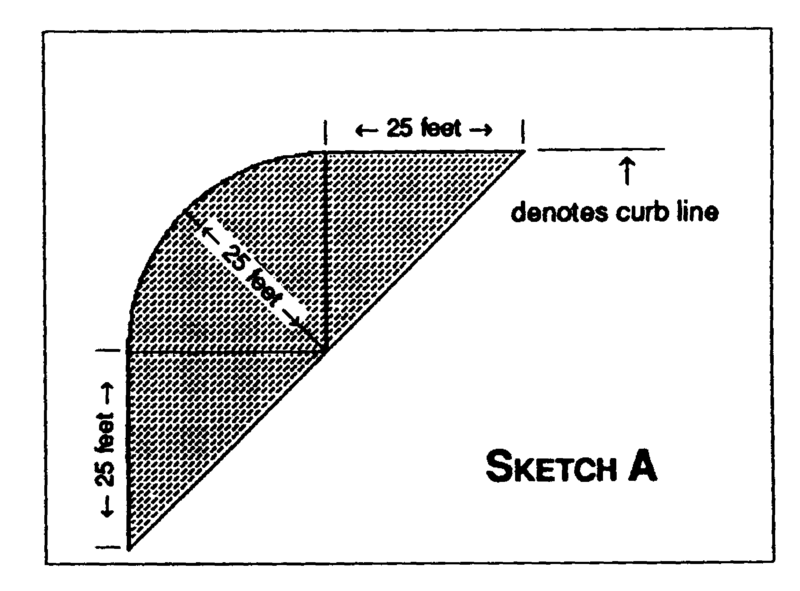 Where lots are subdivided on other than a public street, the designated street line, for purposes of front yard measurement, shall be parallel to and 25 feet distant from the center line of any access easement or right-of-way. Editor's Note: Former Subsection G, pertaining to corner lot yards, which immediately followed this subsection, was repealed 11-24-2014 by L.L. No. 16-2014. Exposed rooftop bulkheads, elevator penthouses, stair towers, water towers, fire towers, hose towers, cooling towers, or mechanical or electrical equipment, provided such features occupy, in the aggregate, no more than 10% of the roof area of a building measured in plan/aerial view and are set back from the edge of the roof at least one foot for each one foot by which such features exceed the maximum height otherwise specified for the district in which they are located. All exposed mechanical and electrical equipment located on the tops of building shall be buffered. Chimneys, provided such features occupy no more than 10% of the roof area of a building measured in plan/aerial view. Parapet walls or cornices, provided they do not exceed the maximum height requirement for the district in which they are located by more than four feet. Solar energy systems, provided such systems are erected only to the height necessary to accomplish the purposes they are intended to serve; a certificate of appropriateness shall be required for such systems. Chapter 227, Signs, of the Code of the Village of Cooperstown provides the requirements for all signs erected as accessory uses to any uses permitted in this chapter. The provisions of the State Environmental Quality Review Act (SEQRA) shall be complied with as appropriate. Fees for SEQRA processing are in addition to other fees required by this chapter as set forth in the Standard Schedule of Fees of the Village of Cooperstown. Editor's Note: Current fees are on file in the office of the Village Clerk. If a proposed site is in a flood hazard location identified by the Federal Insurance Administrator pursuant to the Flood Disaster Prevention Act of 1973, as amended, any proposed activity or construction on such a site shall be subject to the requirements of Chapter 107, Flood Damage Prevention, of the Code of the Village of Cooperstown. Not more than 30% of trees with a trunk diameter of six inches or more on any property may be cut or drastically altered in configuration in any district within a ten-year period. In addition, within 20 feet of the shoreline of the lake or the river, not more than 30% of the small trees or bushes may be cut or drastically altered in configuration over a ten-year period. Site development plans must detail all proposed tree and brush removal. This subsection shall not apply to the pruning or cutting of trees that are diseased or unsafe. The Village Board hereby authorizes the Planning Board, simultaneously with the approval of a subdivision plat in accordance with § 7-738 of the Village Law, to modify the applicable bulk and area provisions of this chapter. At the discretion of the owner (or subdivider) with the approval of the Planning Board for any residential district. As a requirement by the Planning Board for the Residential R-1A District. The procedure may be used to modify the minimum lot area requirements; lot width; front, side and rear yards and setbacks; and street frontage. This procedure shall not be used to modify the requirements for building height. The application of this procedure shall result in a permitted number of dwelling units which shall in no case exceed permitted number of dwelling units which could be permitted, in the Planning Board's judgment, if the land were subdivided into lots conforming to the minimum lot size and density requirements of the zoning applicable to the district or districts in which such land is situated and conforming to all other applicable requirements. However, in the calculation of the number of such permitted lots, the Planning Board shall not consider areas of the tract which are unbuildable due to the presence of conditions such as wetlands, steep slopes and areas subject to flooding. The Planning Board may, at its discretion, require the applicant to submit a standard plat along with the clustered plat for the purpose of arriving at the maximum density calculation. In the event the application of this procedure results in a plat showing lands available for park, recreation, open space or other municipal purposes, then the Planning Board, as condition of final plat approval, may establish such conditions as to the ownership, use and maintenance of such lands as it deems necessary to assure the preservation of such lands for their intended purposes. All such conditions shall be approved by the Village Board prior to preliminary plat approval by the Planning Board. That each owner or owners of every subdivision lot shall be an owner in common with the other owners of the subdivision of the land intended to be held as open space. That each subdivided lot shall carry with it a covenant underwriting the payment of taxes on the open space land, which covenant shall bind the owner thereof and every successive owner thereof. A homeowners' or cooperative association or corporation may be formed to hold ownership of the open space, provided that each and every subdivided lot owner shall remain liable for the taxes, operation and maintenance of the open space land. Such other mechanism or form as shall be approved by the Village Board which shall satisfy the requirements of the payment of taxes and the operation and maintenance of the property so created. Other elements such as the type of access to be provided to the site, the type of grading and landscaping to be carried out, the amount of buffering, drainage, etc. If the owner of subdivider of the land being subdivided desires or is required to make this modification, he shall make application to the Planning Board at the same time as applying for subdivision approval in accordance with Chapter 245, Subdivision of Land, requirements. The Planning Board, before modifying such requirements shall find that such modification would be consistent with the intent of this authorization, in conformance with the intent of the Comprehensive Area Development Plan and, in the Board's judgment, beneficial to the interests of the Village and the neighborhood in which the subdivision is located. If as a result of this procedure lands are make available for common open space or public use, such lands shall be clearly indicated on the subdivision plat. The Planning Board shall hold a public hearing upon the application for modification of zoning requirements prior to the approval thereof, and such hearing may be held simultaneously with the hearing upon the preliminary subdivision plat. On the filing of the plat in the office of the Otsego County Clerk, a copy shall be filed with the Village Clerk, who shall make appropriate notations and references thereto in the Official Zoning Map.